There was more than just prizes up for grabs for the best cosplayers at last month's Amecon anime convention. Cosplayers were also given the opportunity to vie for Britain's final qualifying spot for the inaugural Euro Cosplay Championships, joining the winner of the May MCM London Expo's cosplay competition in October's final against the best cosplayers from across Europe. 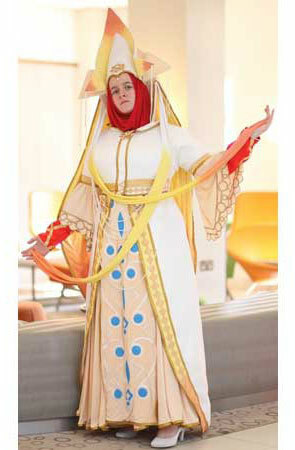 Cosplay - short for 'costume play' - is one of the aspects of anime culture that has really exploded internationally. Near enough every anime convention and expo across the world featuring cosplay competitions or masquerades, and for many cosplay is the main reason to attend these events. The idea of an pan-European cosplay competition has been mooted several times in the past but has always stalled either because of organisation or money. However, with the financial backing and event experience of the MCM Group, organisers of the ever-growing MCM Expos and Memorabilia, the Euro Cosplay Championship has become a reality. This October the Expo is flying in the winners of 30 affiliated cosplay competitions from 18 separate European countries to compete for the grand prize of a trip to Japan. affiliated event runs their cosplay competitions in their usual way, selecting their winners by their own rules. These winners are then brought to England to be judged in the final by the same rules applied for the Expo Masquerade, with marks given for accuracy, construction and stage style. Each contestant is interviewed by the judges about how they made their costume and why, as well as showing the costume off on stage before the wider audience. To avoid claims of bias the organisers are using judges from non-European nations, all of whom will be experienced cosplayers in their own right. or pay for their accommodation. The Expo can, but it's still a cost that could bite if the event doesn't take off. "Euro Cosplay is in the interests of both the Expo and the fan community" explains Joe, "The Expo gains the prestige of hosting an international event and hopes to raise its profile both with individuals and the media industry. For cosplayers it raises the profile of the UK cosplay community both at home and abroad, bringing the hobby to wider attention. It's a win-win situation if the event is successful." Even with the financial backing though a hell of a lot of work has gone into making the event happen. Contacting numerous international events, pitching the Euro Cosplay idea to them and co-ordinating everything was a mammoth task, so how did it all come together? "Because James is a legend!" says Joe, referring to fellow organiser James 'Ilpala' Funnell, "He's put in years of work behind the scenes building contacts and getting them on board." James is heavily involved in the organisation of the cosplay and fringe events at the Expo, and it's clear that he's put a colossal amount of work into making Euro Cosplay happen. "It was quite tough for a while." he says, "people were cynical because of failed attempts in the past, but once we got a couple of events on board, more followed. It was like a cascade effect, we found interest from countries we never expected and we've had further interest since the cut off. If this year's event is successful we already have another three countries who missed the deadline but could participate next year." Was the eventual level of interest surprising? "A little" says James, "cosplay was bigger in some countries than we expected, but we aimed to be as inclusive as possible so we're happy." be Thaís Jussim (better known as Yuki). Yuki has become one of Brazil's most recognisable cosplayers since performing for her country in the World Cosplay Summit and is a regular guest at Brazil's Video Games Live show and several other South American anime and game events. She's also participated as a guest in Rio de Janeiro's famous Carnival Parade. Keep an eye on the Euro Cosplay site and listen to the MCM Buzz podcast for up to the minute news on the other judges, we get a feeling they could also be quite impressive. So what about the future? "At the moment we're really hoping this event is a success" says James, "If it is then we hope to do it again next year, it would probably be in the same format due to the problems with co-ordinating changes internationally, but it should have more competitor nations. The three who missed out this year include Latvia, so they'd be in next time, and we hope to get the word out into the Balkan states too. It's quite hard to find out about events there." Joe agrees, "it's all dependant on how the first event goes. If it goes well it raises our profile, word spreads and more people want to compete. We've always had positive feedback on the Expo Masquerade from overseas attendees so we are hopeful we can can give a good experience to the finalists and make the first Euro Cosplay Final a successful event." The belief in the event and the love of cosplay Joe and James share is a driving force behind Euro Cosplay, and if anything will make it a success it's their genuine enthusiasm. "We wouldn't give up our time and take on all this stress if we didn't think it was worth it" says Joe, "I think Euro Cosplay could have a positive impact on cosplay in the UK, and could potentially have side effects that are bigger than the event itself for the community as a whole. It's aspirational, and will hopefully inspire people and increase creativity. Cosplay is a creative hobby that nurtures transmutable skills, there's a lot you learn from making a costume and performing on stage. Practical skills, mental preparation and presentation skills. Then there's the discussion you have with the judges in the competition, which is great interview practice for employment and education." Neither Joe or James would reveal who their money's on for the final. "There's no dark horses, we're going to see the best of Europe's cosplayers going all out. All of them have won at least one cosplay competition, they're all seasoned cosplayers. It should be spectacular!" says Joe. "We just want to pull out all the stops, show the rest of Europe how big cosplay is in the UK" agrees James, "We want to impress, and hopefully the costumes on show can surprise the countries in the World Cosplay Summit." We hope so too, Euro Cosplay is a chance for the UK to step up to a new level when it comes to international anime fandom and also push the Expo into a bigger league than it already occupies. We look forward to the Finals with great interest, to echo Joe's sentiments - it should be spectacular!